Create friendships that will last a lifetime! Discover the beauty of untamed nature, the awe of ancient history, and the powerful presence of a holy culture. 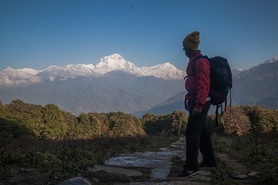 Experience Nepal. This 20-day trip will take you on a journey through the heart of the Himalayas and deep into the place where so many spiritual practices were born. Paddle across freshwater lakes surrounded by towering white-capped mountains, hike to remote teahouses and monasteries, wake up at dawn and sit in temples listening to the calm chant of the morning pujas, and practice yoga in the most breathtaking settings imaginable. Let your soul soar as you experience life on the roof of the world! You might say Sri Lanka has not yet been discovered. Lots of travellers have passed overhead on their way to someplace else, but years of uncertainty kept Sri Lanka off the traveler trail. Now, however, all that has changed. The country is moving forward quickly as more and more people discover its myriad charms. Lying between the more travelled parts of India and Southeast Asia, Sri Lanka's history, culture and natural beauty are undeniably alluring. It's the perfect setting for an intensive training! We are about enriching your life through exploration, education, nutrition and body work. 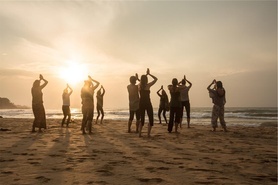 We offer a wide variety of activities because we understand that to some an inspiring journey is rafting,trekking, and safaris, while others prefer meditation, yoga and body work. And some enjoy a mix. Our aim is to set the stage for your dream trip, let us take you where you want to go.